Saptamana trecuta am fost implicat intr-un proiect Youth in Action care a avut ca locatie pentru desfasurare orasul nostru, Bacau. Au fost prezenti membrii din Georgia, Macedonia, Serbia, Republica Moldova, Romania, UK si trainerul din Italia. A fost un proiect interesant, si ciudat ce-i drept pentru ca eram obisnuit sa particip la astfel de proiecte in alte tari, nicidecum la mine in oras. 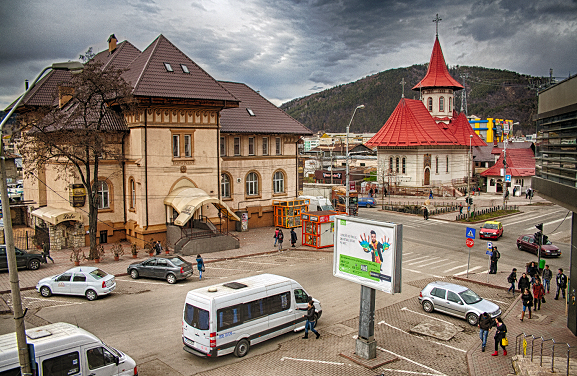 300 km away from the capital city of Romania - Buchurest, on the river Bistrica, lays the beautiful city of Bacau. That is the place where a training course was held in the period from 15th till 22nd of March. 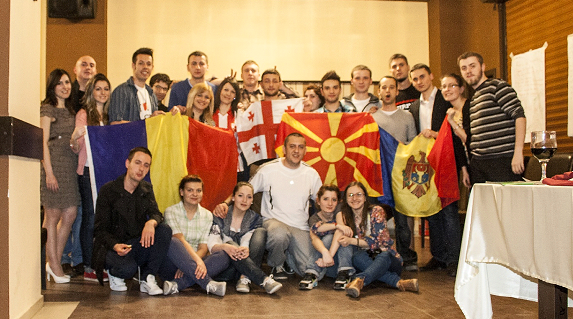 Countries which took part in this project were: Macedonia, Serbia, Moldova, Georgia, and Romania. 20 participants were actively involved in different types of learning activities and workshops, thus contributing to the success of the project. The main purpose of this project was peer education, where the skilled participants shared their knowledge with the others in order to prepare them for other projects in the future. The training course was divided in two parts – learning and production. During the first part of the course, the participants learned about the importance of peer education and sharing knowledge, whereas the second part was aimed for production and practical usage of gained knowledge. In the first section, participants were taught about the subject through fun activities, working in mixed groups or alone. Each day was divided into learning part and quality free time. At the beginning of each working session, participants were motivated through energizers, which were prepared by the trainers. During the working sessions, participants were divided into mixed groups where they, among the rest, were overcoming the language barrier. After each working day, participants discussed about working sessions in their reflection groups, which were created randomly. At the end of the working day, participants enjoyed free nights. On the first day, participants got to know each other through some games and the trainers presented the agenda and the main goal of the course. Furthermore, they set up the rules of the training course, which participants respected during the project. On the same day, the peers build teams for production projects. The day finished with karaoke night in a local café. The second day was reserved for introducing the terms SDL (Self-directed Learning) and ODL (Other-directed Learning). Moreover, peers “flew over” the River of Learning, where they learned about the things that had most influence on their lives. The participants discussed about Hart’s ladder and ended the day with going out. On the third day, participants focused on creating fishing net for some further projects. They also discussed about personal attributes that can help or hinder them in their future work. The trainers familiarized the peers with the term “assertiveness” through practical activity. During the free night, intercultural night was organized, during which every country presented their culture, history, tradition, folk dances, and national dishes. Next day was structured in a way to encourage breaking the barriers in language, behavior, culture, and gesticulations in intercultural society. On this day, HGO fair was held, where the participants presented their sending organizations. The fifth day was the free day. 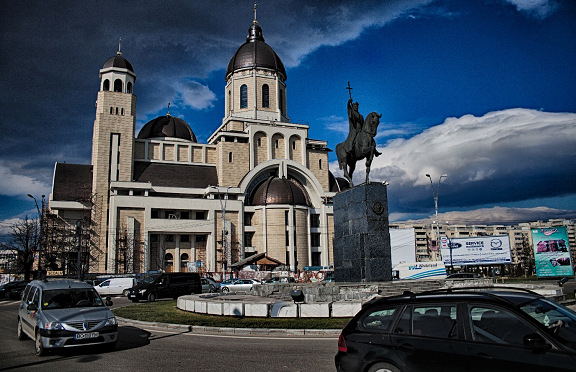 Peers went on an excursion to Piatra Neamt, where they visited some historical monuments and churches in the town. On the sixth day, participants were introduced for writing an application for Youth in Action program and they had assessment to write their own project. On the same day, the workshops were presented. These workshops were prepared by the participants. Peers learned how to take better photos without any equipment, how to apply for Work and Travel program in USA, and learned more about life in Australia and Iraq. The host country prepared national dish, folk dance and souvenirs for the participants during the Romanian night. The final day was reserved for evaluation and production. Peers worked together in order to produce works from different fields – writing, video-editing, design, journalism, and composing an anthem for the training course. These six days were just a beginning for further projects the participants are planning to organize. It is interesting to see how from strangers all the participants gradually became friends. This project is a good example of cooperation between young people and crossing all the boundaries between nations. All participants share the same thought that there should be more projects like this in the future. 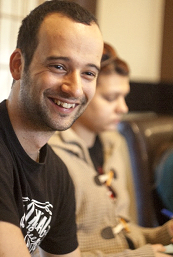 Writers: Dragana Petrushevska, Vladimir Čukić, Voislav Dabevski. Eu am facut un video care subliniaza momentele principale din aceasta saptamana. Pentru ca proiectul a tinut 7 zile, iar video-ul are 7 minute, pot spune ca m-am limitat la 1minut / zi!